Running an agency of any size can be a very time-consuming ordeal. You have prospective clients knocking on your door, current clients needing exposure, and past clients looking to re-sign. Before you know it strikes six, and you are commuting home in heavy traffic thinking about the morning ahead. Repeat ad nauseam. What if we could save you time, help you scale, and provide a one-stop-shop for all your social media campaign needs. 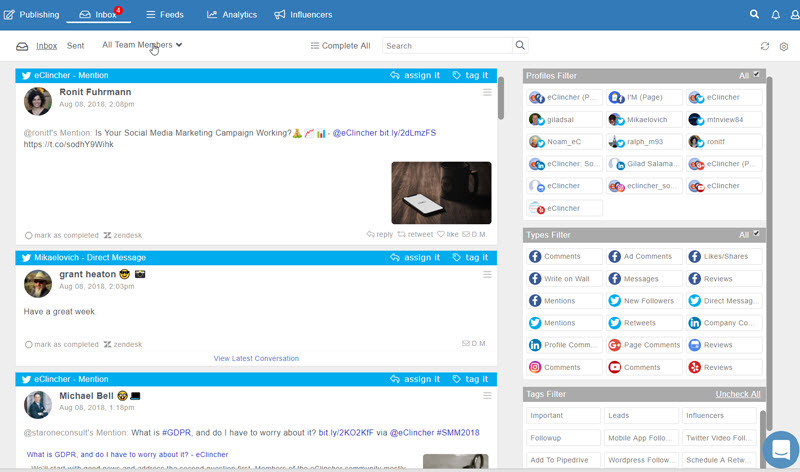 eClincher is a complete social media tool for content publishing, post scheduling, social media monitoring, and analytics. 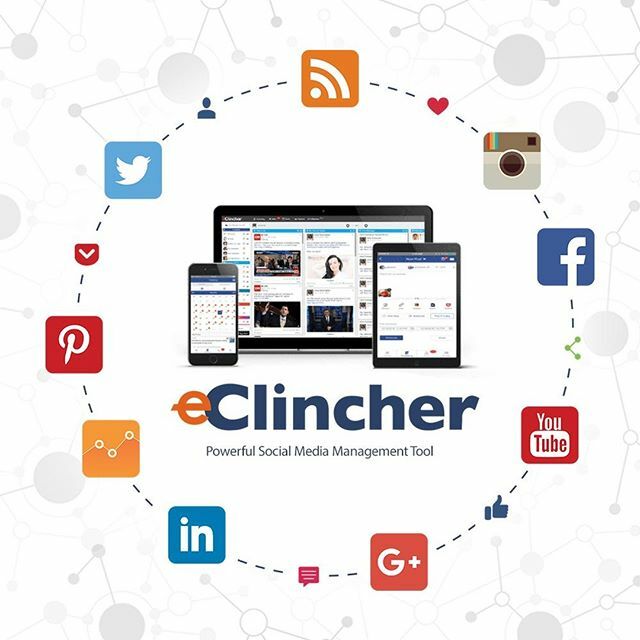 With eClincher you can assign team members to manage specific social media accounts or brands, including separate login credentials. 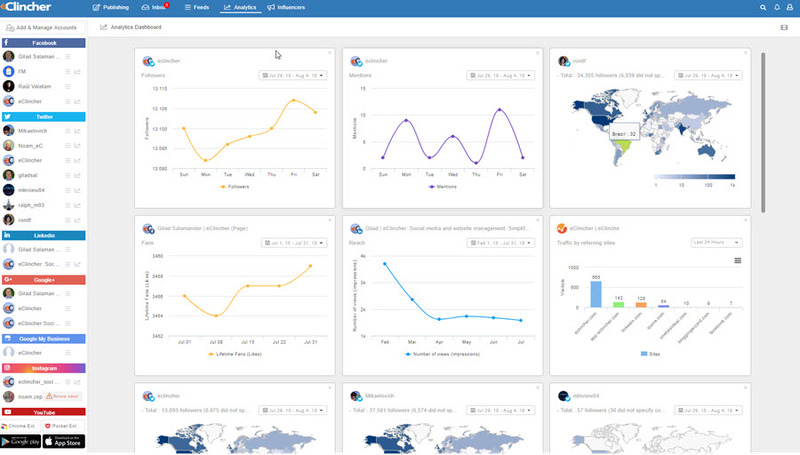 eClincher allows an agency to successfully manage multiple clients in one dashboard. It’s easy like Sunday Morning or rather Monday lunch, to add a client’s: Facebook, Instagram, Twitter, LinkedIn, Google My Business, Google+, Pinterest, and YouTube channel to their brand profile. Schedule a tweet for Old Spice, and with a click of a button, post an infographic for Chanel. I don’t have to tell you that some posts perform better at certain times of the day, while a post listing delicious Kellogg’s breakfast recipes might lose traction in the evening, a post promoting the latest Burning Man shenanigans might exceed expectations. eClincher enables you to schedule a post for any time of day, month, or year. Have viral content from the past on a topic that’s trending right now? With eClincher you can recycle old content, posting posts you wrote months ago today. Want to share a tweet this week, and re-share it in the future (e.g. during product launch) you can. What if you want a #tbt( Throwback Thursday) or #fbf (Flashback Friday) series of posts. eClincher allows you to upload several posts (via a CSV file), add them to your posting calendar, and publish them on specific days. 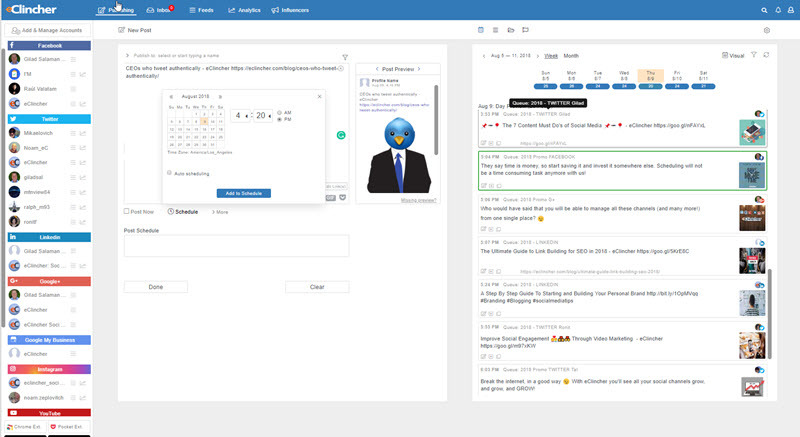 eClincher lets you view your entire month’s worth of social media posts in calendar view or list view, making it easy to see what you have scheduled. You can also track individual post performance, telling you which content went the distance, and which still needs maintenance. 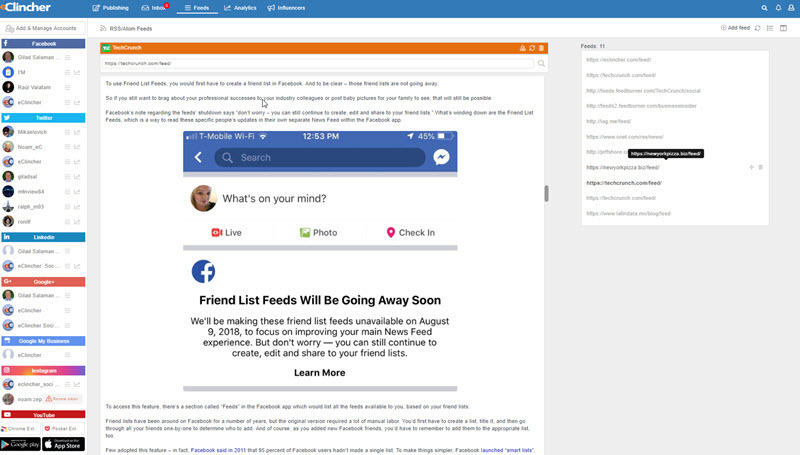 eClincher has a universal inbox where you can see all of your incoming messages and notifications, and respond to your client’s social media interactions, comments, mentions, and new followers, all from one window. You can choose the social media channels/notifications/messages you want to be displayed. 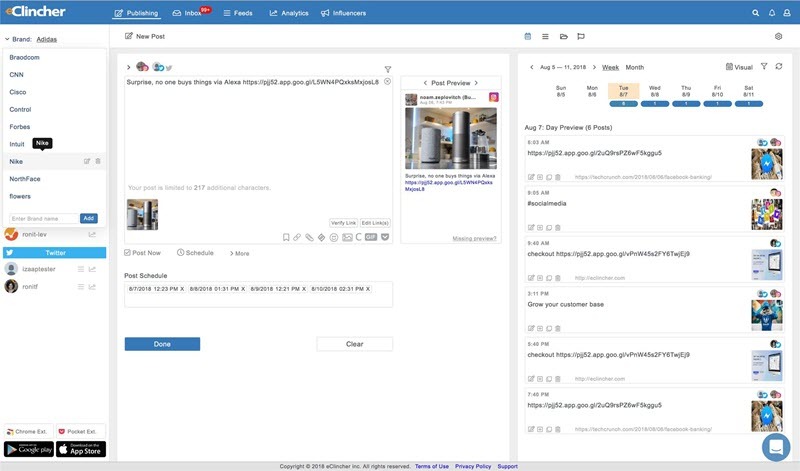 All of your old notifications and messages are archived, and keyword searchable. You can also tag and organize important items for later reference. E.g. When a client asks about a deadline, you can tag that query, access all the individuals that mentioned the deadline, and follow up with them. 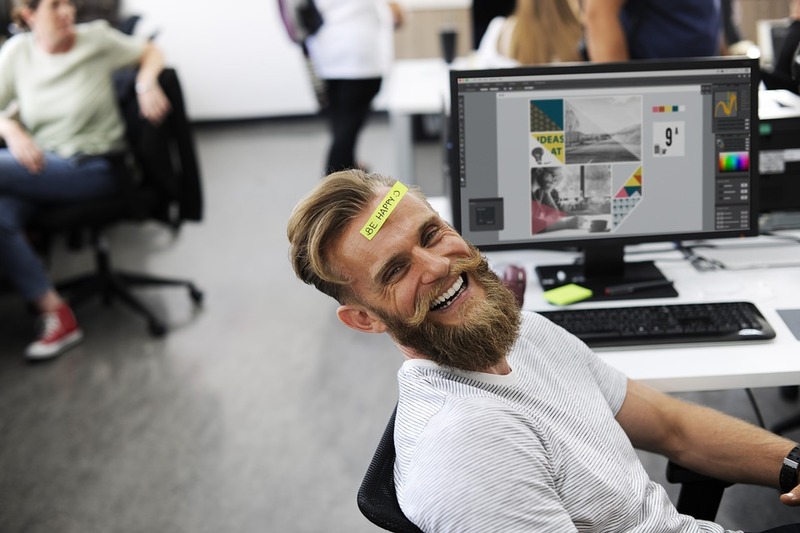 So you ran a successful social media campaign for a client thanks to eClincher, and now the client wants to see the results. With eClincher’s in-depth analytics tool you will be able to give a very detailed quarterly report to your client. 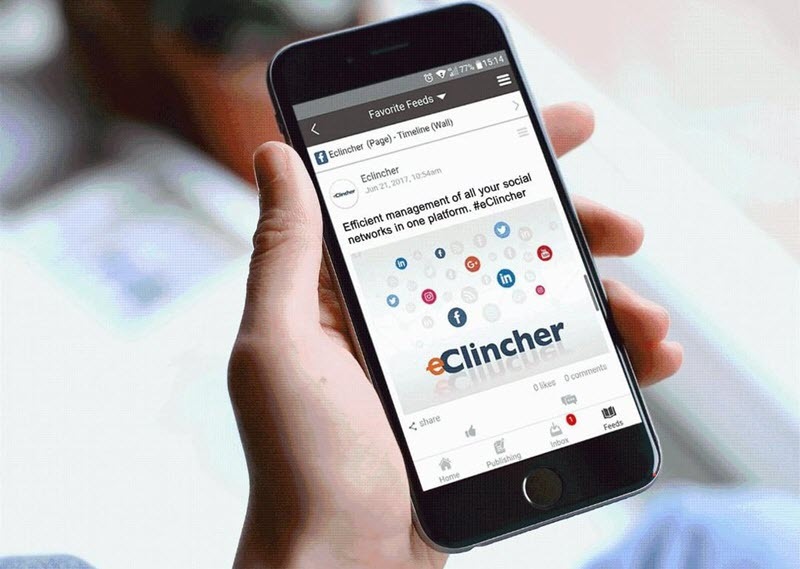 eClincher combines analytics from different social media channels in one simple and inviting window, and goes an extra mile, incorporating Google Analytics, Facebook Analytics (including real-time traffic), LinkedIn company page analytics, Blogger and YouTube into its analytics dashboard. The eClincher RSS Feed tool allows you to not only add RSS feeds of your favorite sites but view new content as it’s uploaded. See something you like, share the content or schedule it for a later date. Between team meetings, client pitches, and coffee runs, we know you’re busy, right? That’s exactly why we developed our intuitive mobile app. The eClincher mobile app has the same intuitive dashboard as its desktop counterpart (finetuned for the mobile experience) so you can“Post on the Go!” You’re invited to download the easy-to-use mobile app from either the iTunes App Store or the Google Play store. 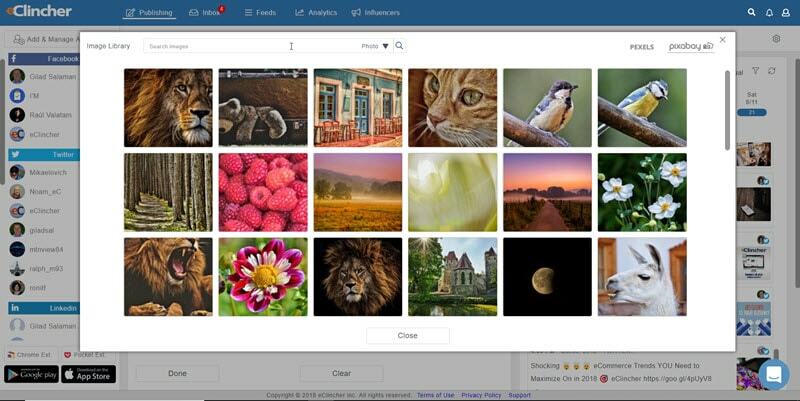 eClincher connects with Pixabay.com, Giphy.com, and Canva.com, where you can find images, create and edit images, attaching them to your post. Not convinced?, try eClincher risk-free (no credit card required) for 14 days.